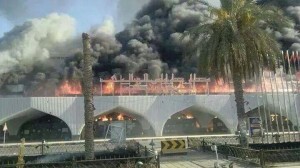 Tripoli International Airport in flames in the summer of 2014 after it was destroyed by militia fighting (Photo: Social media). The Minister of Communications and Transport of the Faiez Serraj-led Presidency Council, Milad Matoug said that construction of Tripoli International Airport would commence within ‘‘the next few days’’. Tripoli International Airport had been destroyed during the Tripoli 2014 militia fighting. The capital has since been forced to use its smaller Mitiga airport instead. Mitiga airport is the renamed former US Wheelus Air Base. Matoug made the revelation during the Libyan-Italian Economic Forum that was held in Tripoli last Thursday. Matug noted the holding of the Forum and its dedication and desire to the joint action between the Italian and Libyan sides in their common interests. The Minister of Communications and Transport also referred to various other projects that his Ministry intended to implement in the areas of communication and transport, and he gave special reference to projects that will be implemented by Italian companies. These included the coastal motorway from the Tunisian border to the Egyptian border, or the development of Zuwara port, as well as several other projects in the sector. It will be recalled that a delegation from an Italian construction consortium had visited TIA for an inspection back in October 2016. In December, Matoug had confirmed that an Italian company would commence work on TIA early in 2017. 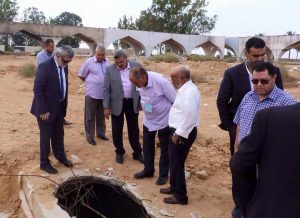 An Italian construction consortium visited Tripoli International Airport in October 2016 with a view to making an offer to reconstruct it (Photo: LAA). Matoug had been speaking at a forum on the Libyan transport sector held in Tripoli organized by the Libyan African Aviation Holding Company – which owns both the main state airliners Afriqiyah Airlines and Libyan Airlines.